How fitting that when a pair of 18-year-old future musical theatre songwriting partners and soon-to-be best friends, Benj Pasek and Justin Paul, met as college freshmen, one of the things they bonded over—along with an obsessive knowledge of show tunes, a gift for nimble, smart-alecky banter, and an unwarranted belief in their skills as freestyle rappers and beat-boxers—was a particular affinity for shared idol Stephen Sondheim’s flop-turned-cult-classic Merrily We Roll Along, which chronicles the ascent of a Broadway songwriting duo, backwards from world-weary cynicism to bright-eyed optimism. 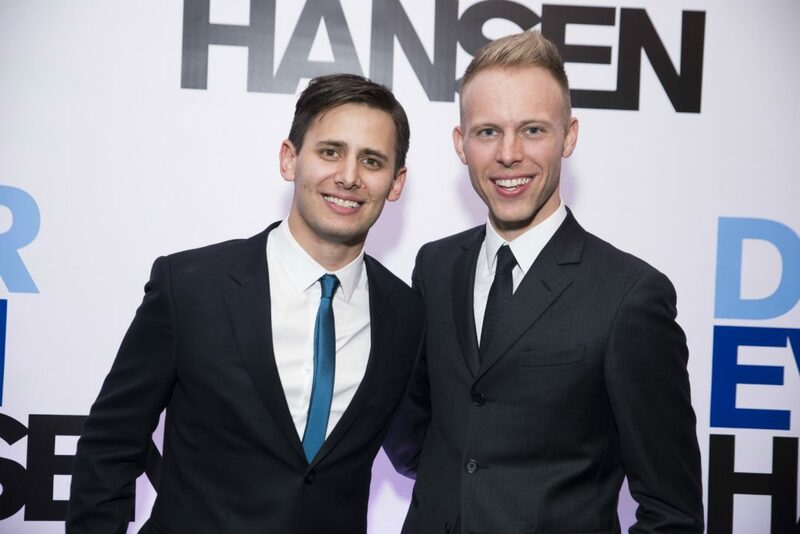 “Our Time” is indeed an apt anthem for the moment in which Pasek and Paul—still fresh-faced and bristling with enthusiasm at 33—find themselves: Tonys for Dear Evan Hansen and Oscars for their lyrics to the song “City of Stars” from La La Land on their mantels; their big-screen musical The Greatest Showman both a box office marvel and bona fide pop culture phenomenon; a live-action Snow White film in the works for Disney; and still more theatre and film projects at various stages of development. Fourteen years into their partnership, the two are no longer bright, talented kids with promise, but new members of the aristocracy of success. Theirs is a marriage of opposites. A practicing Christian married to a journalist, Paul is lanky and pale with a swoosh of blond hair. Jewish and gay, Pasek is swarthy and compact. And they play off each other with the practiced timing of a vaudeville team—or a pair of songwriters who finish each other’s sentences, riff on each other’s jokes, and shoot each other glances that only they understand. Every song begins and ends with Paul composing the music at the piano and Pasek writing the lyrics on his MacBook. But the key to their partnership, they say, is how their individual strengths and weaknesses dovetail to create a whole that is greater than the sum of its parts. Since the beginning, they have shared credit for both music and lyrics: “The idea is to make the songs sound like they emerged from one mind and speak with one voice,” Paul says. Paul grew up first in St. Louis and then Westport, Connecticut, and his parents instilled in him a love of music. He started singing with his father, a pastor, in church as a young boy, and the soaring emotionality of gospel embedded itself in his musical DNA. Cast in a local production of Oliver! and soon armed with the original cast recording of Cats, his life became all about musical theatre. 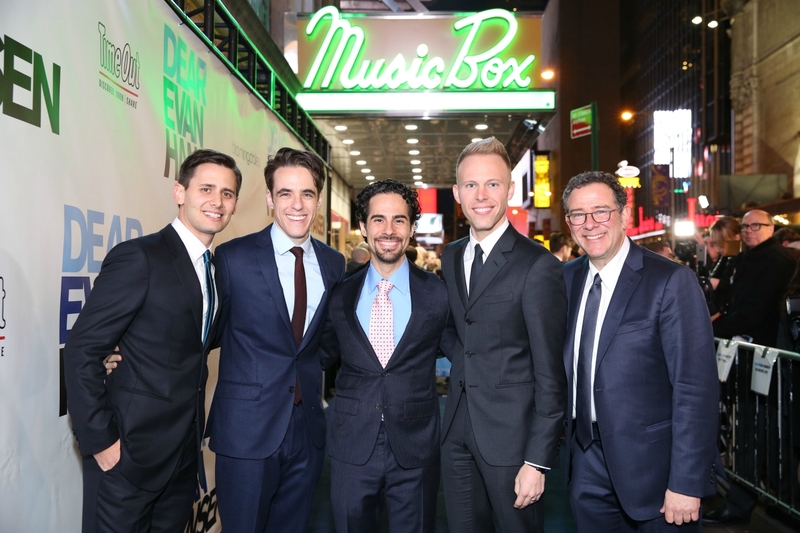 “Dear Evan Hansen” creative team members Benj Pasek, Steven Levenson, Alex Lacamoire, Justin Paul and Michael Greif. If no one would cast them in a musical, Pasek and Paul mused, why not write one of their own and put it on themselves? They had taken a stab at a songwriting collaboration as freshmen and already had three songs ready to go. “When we got in the room, we had this perfect combination of ADD and a creative spark together,” Pasek says. Crafting theatrical songs that they could imagine in a musical, they were guided by the questions they had learned to ask in their acting classes: Who are you talking to? What do you want? What’s your obstacle? During what they call their “dark night of the soul” over their 2005 spring break in Florida, they committed to writing a full show—and to each other as collaborators. Lacking the know-how, not to mention the time, to write a full book musical with a plot, they decided to create a thematically linked song cycle. Back at school, they booked Ann Arbor’s Kerrytown Concert House that April, invited everyone from their department, enlisted four fellow school musical rejects as performers and, spurred by the looming performance, spent the next three weeks racing against the clock to write another 11 songs and teach them to the cast. The let’s-put-on-a-show result was Edges, whose title is a nod, appropriately, to a lyric from Merrily We Roll Along’s “Our Time.” The one-night-only concert was a smash, propelled by clever, tuneful songs about young people on the edge of adulthood, trying to maneuver the challenges of romance, friendship, responsibility, and ambition. They uploaded videos of their concert to YouTube and, through Facebook, figured out which colleges had theatre departments and pitched the show to those schools. Within a year, 13 colleges had mounted Edges. After its first professional production in 2007, it has since been performed all over the world. Well before they’d turned 30, Pasek and Paul had established themselves among the best and the brightest of the upcoming generation of musical theatre writers. By 2013, after the era- and setting-specific songs they’d just crafted, they longed to return to the kind of contemporary sound and setting they had first explored with Edges. And, after three musicals based on existing material, they wanted to write one that was completely original. Of all their achievements—including their subsequent, splashy storming of Hollywood—there’s no question that Dear Evan Hansen remains closest to their hearts. “It’s the culmination of everything we’ve done, and everything we’ve wanted to do, since we first started writing songs together,” Paul says. Dear Evan Hansen, Ahmanson Theatre, 135 N. Grand Ave., downtown; Oct. 17-Nov. 25. Tickets at centertheatergroup.org. Zoot Suit Creator Luis Valdez Brings a Quintessentially California Play to L.A.